Over on his Twitter feed Sylvain Azarian (@sylvain_azarian / F4GKR) has been tweeting about his new antenna calibration method which involves the use of a HackRF SDR and Raspberry Pi mounted on a drone. The idea is to use the drone as a remote beacon which can move all around the antenna. As the drone flies around, the HackRF on the drone emits a data chirp containing GPS telemetry of the drones position. The receiver on the ground decodes this data and also determines the SNR of the received signal. By plotting the received SNR together with the drones GPS position, the radiation pattern of the antenna under test could be determined. The software is called “RadiantBee” and is developed by both F4GKR and F5OEO. It is available over on GitHub. 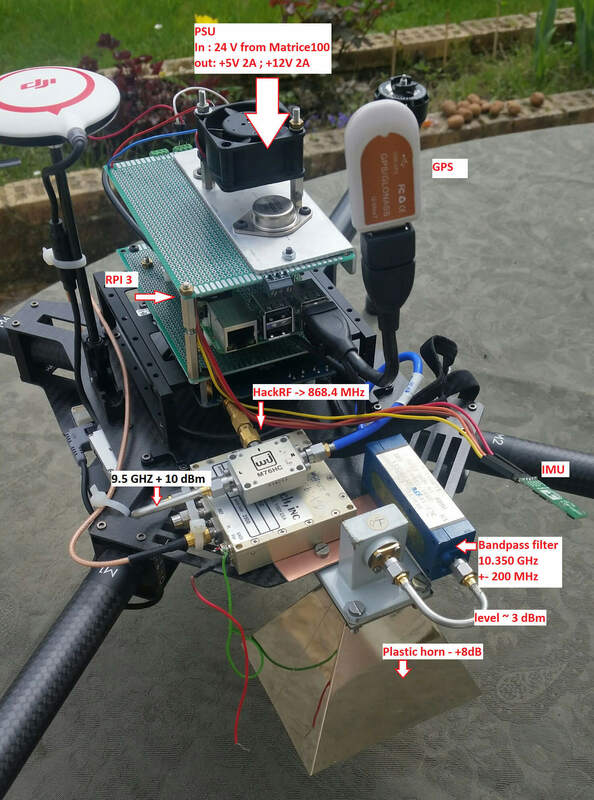 The flying hardware consists of a quadcopter, GPS, Raspberry Pi 3, HackRF, 10 GHz upconverter, band pass filter and horn antenna. The base station consists of an RTL-SDR dongle, 10 GHz downconverter, GPS and the antenna under test. Why not just to have fixed receiving equipment, and at some distance in a field transmitter with antenna on rotating platform? Classical antenna diagram setup. No drone needed. Interesting idea. I suspect that the radiation pattern of the horn on the drone may also need to be calibrated and the orientation of the drone carefully controlled in order for this to be actually useful.